The newest Deus Ex game, Mankind Divided, comes out next week. It tells the gripping tale of a man with robot arms and his quest to steal alcohol from every apartment in Prague. I’ve completed Mankind Divided’s story (took me about 26 hours on the middle difficulty), as well as a bunch of the included extras. I’m still really getting to the bottom of some of the game’s systems, however, and am investigating some alternate methods of play, so I’m not quite ready to kick my review out the door just yet. That’ll run early next week, probably on Monday. Big picture: It’s good, particularly if you decide you want to take your time and get creative with how you play. It’s less narratively ambitious than its predecessor Human Revolution and feels smaller in scope—the majority of the game takes place in and around the central hub of Prague, and even the farthest-reaching missions don’t leave Europe. As a result, the narrative feels more intimate than Human Revolution, but the game’s designers use that more constrained scope mostly to the game’s benefit. The changes to the control scheme are certainly for the better, at least with a controller. While none of the new augmentations feels essential, they’re all a lot of fun to screw around with. Prague is an impressive feat of level design and has given me hours of enjoyable exploration, particularly on my current New Game+ playthrough. I’ll have more in-depth thoughts in my review next week. For now, I wanted to share a few short video clips of some of the very important and meaningful things you can do in this game. 1. Ruin a nice young couple’s photograph. The hub city of Prague is a lively place. It’s the game’s primary setting, and it’s far larger and more complex than it may seem at first. On my second playthrough I’m noticing all kinds of little background details that I missed the first time through. Take this young couple. They’re on vacation in Prague, apparently, despite the fact that in this game Prague is basically a futuristic version of 1941 Warsaw. When they get home and really take a look at their travel photos, they’re going to realize that a handsome bearded photobomber came along for the ride. I’m kinda surprised they never noticed or said anything, tbh. 2. Accidentally drop a guy down a manhole. My first playthrough of Mankind Divided was entirely nonlethal. That meant that whenever a hapless guard came ‘round my corner, I clicked the thumbstick, rather than holding it down. Usually that meant Adam would knock the guard unconscious. This time, things didn’t quite go as planned. He’s probably fine, right? I’m sure he’s fine. 3. Climb to the highest places. You will be happy to hear that this is still very much a Deus Ex game, meaning that if you really want to get to that high rooftop, you can probably stack some crap on top of some other crap and get yourself up there. That vantage point didn’t even let me access anywhere cool, but I’m still glad I was able reach it. 4. Creatively deal with turrets. Mankind Divided is all about infiltrating secure locations, meaning you’ll have to deal with camera systems, laser tripwires, marauding robots and machine-gun turrets. While you can hack or attack most of those things, turrets in particular offer some enjoyable alternate solutions. Now you sit there, turret, and think about what you’ve done. 5. Try to figure out what this lady’s deal is. 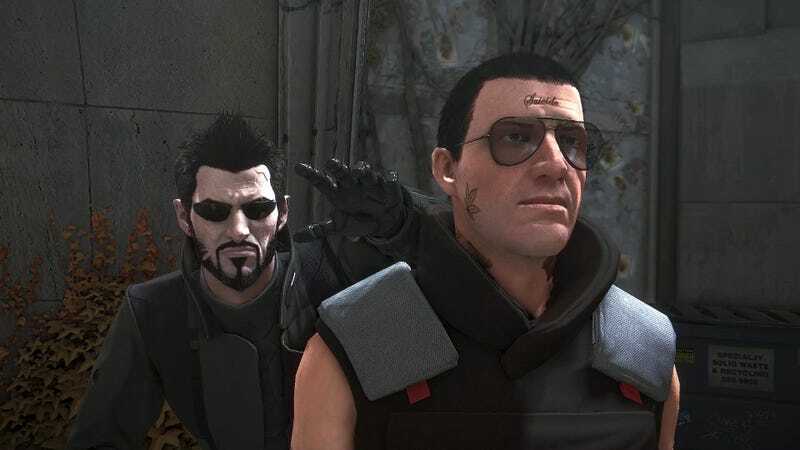 As with its predecessor Human Revolution, some of the NPC performances in Mankind Divided are a little bizarre. For all the game’s advanced lighting tech and volumetric fog, its character animations and lip synching are distinctly behind the curve. What is going on with her? Why is she moving like that? What is with the PEE-culiar way… her VOICE RISES and falls, and why does she space… her words OUT... like that? Maybe people just talk like that in the future. We don’t know. Full review next week. If you’re just wondering if it’s good, though: Yeah, it’s good.